Pit bull type dogs are good dogs. There are many misconceptions about the danger of having a dog like this at home. Some times this go to an extreme in some cities where they prohibit to own a pit bull. Pit bulls for Reynoldsburg is a group in Ohio that is fighting against Pit bull ban. They requested my help as a volunteer through the organization Creative Paw to design a logo to reflect their goals and to have an identity as a group. Based on the information I received, I created a logo that represents any breed and to meet their goal to have a breed neutral law. The dogs in the logo stand out with a white silhouette against bright colors and the heart in the middle represents the Love and Compassion all breeds deserve. "The goal of Pit Bulls for Reynoldsburg is to lobby City Council for a breed neutral law, educate people about the shortcomings of Breed Specific Legislation (BSL), and promote better alternatives." 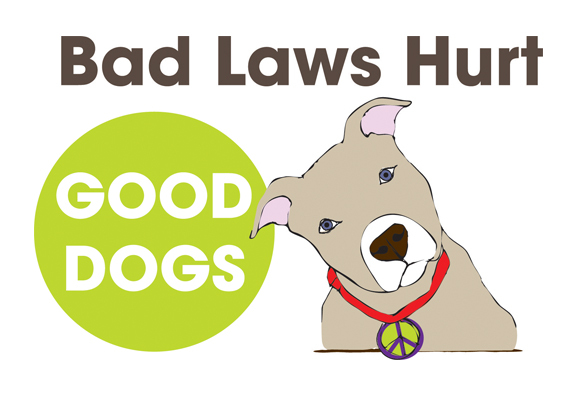 The group needed a second logo/Illustration for a T-Shirt for citizens of Reynoldsburg (and other cities in the future) to wear as a walking billboard and create awareness of how Bad Laws Hurt Good Dogs. This is the logo/Illustration for the campaign. I initially created different options for the logo and they really liked them! The group kept all options to print on T-Shirts too and they opened an online store "in an effort to remove the ban in Reynoldsburg by purchasing merchandise from a new site called Freedom of Dog. Proceeds will go to legal fees to fight the ban in court as well as educational materials to promote awareness to local residents." These are the different options for T-shirts and merchandise. If you want to help, you can purchase the products at this link. It was a pleasure to design the logo and images for a good cause! Please support this group by sharing this post and leave a comment if Pit bulls face the same challenges in your city. If you want to share ideas with this group, please visit their Facebook page.